Epiphone is proud to introduce what will surely become a player’s classic, the new five-string Toby Deluxe-V. The original "Toby" brought real innovation to modern bass players who were hungry for an instrument that could accommodate new styles and sounds. And now, Epiphone and Tobias team up again to put the Toby bass back on the cutting edge where it belongs with the Toby Deluxe-V. The original Toby Bass was designed by Michael Tobias and featured the classic ergonomic body shape that bassists find so easy to play. Toby basses have a focused, "finished" sound that combines the punch of an upright bass with all the clear detail of an electric. And now for even greater sonic variety, the Toby Deluxe-V adds a 5th string tuned to low B. The combination of a low B and the Toby Deluxe’s Active Tonexpressor™ Bass Enhancement Control gives bassists the chance to break through into new dimensions on stage and in the studio at a price that any player can afford. Like all Epiphone instruments, the Toby Deluxe-V comes with Epiphone’s Limited Lifetime Warranty backed by Gibson Musical Instruments’ famous 24/7/365 day Customer Service. Four strings will never be enough again. Check out the bold and innovative Toby Deluxe-V at your favorite Authorized Epiphone Dealer. The Toby Deluxe-V features a solid radiata body and a flush-mount low profile fully adjustable bridge. Like all Toby basses, the Toby Deluxe-V includes a hard maple neck with a Tobias™ Asymmetrical Neck profile, which is a bolt-on design with recessed bolts and washers for easy adjustments. 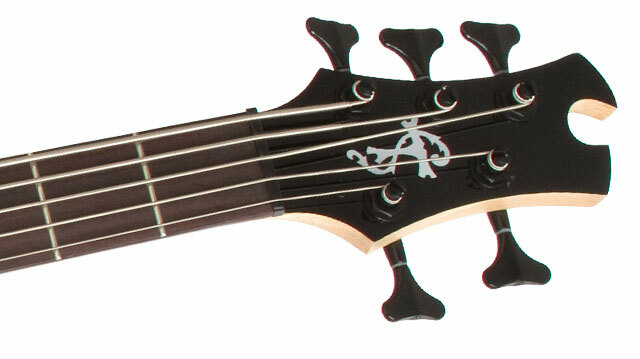 The unique Toby headstock features the iconic Toby logo and Deluxe Diecast machine heads with a 14:1 ratio. Toby basses were among the first to feature an asymmetrical neck, a design in which the neck is thinner on the lower side than on the upper side. The asymmetric shape feels less bulky than standard bass necks for maximum hand comfort even when playing with 5 strings. Adjustments to the truss rod are made at the body end. 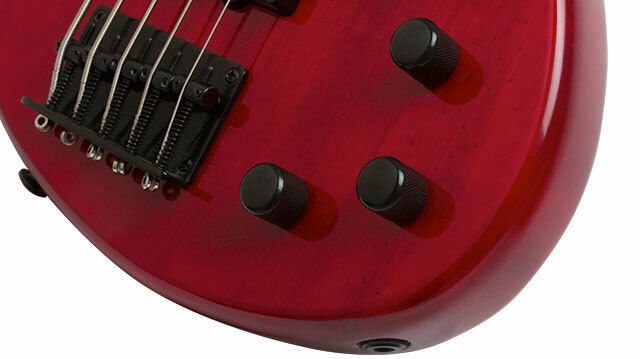 While these satin finished necks might "feel" thinner, there is still sufficient thickness on the upper side to provide for excellent strength, stability and – best of all – deep, rich tone. Your thumb will find easy reference as your hand glides up and down the fretboard. The neck has a 34” scale length for enhanced clarity, a 12” fingerboard radius and a black 1.90” nut. 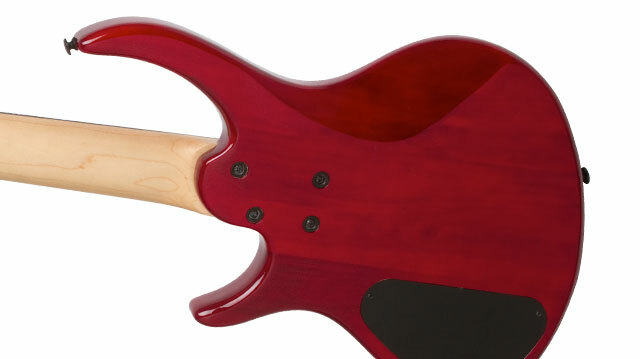 Gloss finishes include Ebony, Translucent Red, and Vintage Sunburst. The Toby Deluxe-V features classic Tobias-designed pickups with a Tobias TBR™ Dual Rail Humbucker Humbucker in the neck position and a Tobias TBT™ Dual RailHumbucker at the bridge. Controls are black, all metal knurled knobs and include Master Volume, Pickup Blend with center Detent, and Master EQ. In addition, an Active Tonexpressor™ Bass Enhancement Control enables you the option of creative blends and is a powerful ally on stage when you need to make fine adjustments to cut through dense mixes. The Active Tonexpressor™ uses an easy-to-change 9-volt battery. Epiphone is known for making the best hardware in the business and that of course extends to the Toby Deluxe-V which includes Deluxe Diecast tuners with a 17:1 ratio to ensure tuning stability along with a fully adjustable flush-mounted, low-profile all metal bridge.